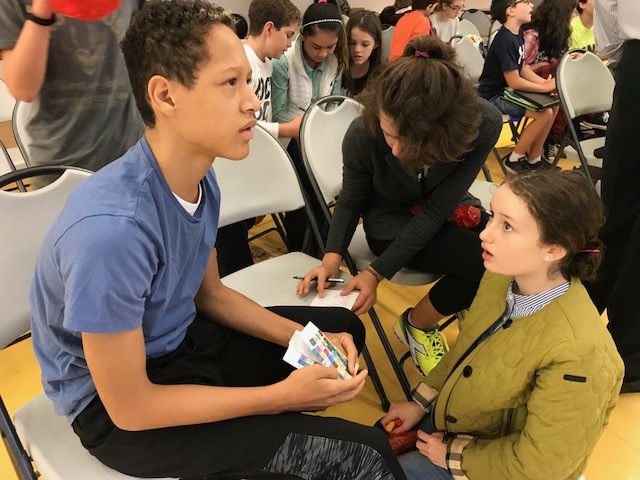 This week, it was once again time to kick off Speyer’s Financial Literacy Program, with members of the eighth grade officially “handing off” the responsibility for management of Speyer’s Financial Literacy Fund Portfolio to a very eager seventh grade. One watching the events of the morning could say the seventh graders are very invested in this aspect of their curriculum...c’mon we had to go there! 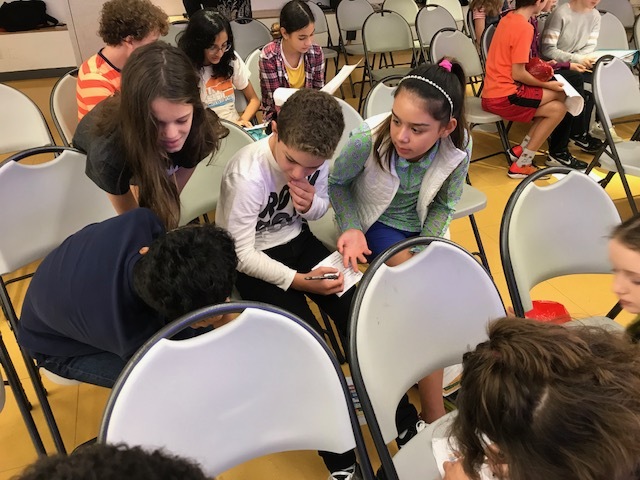 Yes, the centerpiece of the financial literacy curriculum for the seventh grade is the students become the managers of a real portfolio, which was a gift from Peterson/Harada family. Each incoming grade has a gift of $20,000 and over their nine years at Speyer, this portion will grow with investment returns. At the time of their eighth grade graduation, the original $20,000 rolls forward to the incoming Kindergarten class, and the increase in total value from inception is quantified. This value is then split into two: first half is allocated by the eighth graders as a graduation gift back to Speyer, and the second half is gifted pro rata to the students themselves to further their education. During their explanation of what the seventh grade will tackle throughout the school year as the fund portfolio managers, the eighth graders shared what stocks are currently in the portfolio, as well as how they will review and rebalance the portfolio (with input from Speyer’s CFOO Scott Molin and Head of Middle School Michelle Cristella, as well as advice and oversight from Lauren Matles and Michael Katz from Wells Fargo Advisors). Currently, the portfolio is $261,309.58…and, as far as we know, no other seventh graders in the country manage an investment portfolio of this magnitude. This is unprecedented, and yet another example of what makes Speyer's curriculum so rich and relevant. Following the formal portfolio handover, the seventh graders and the visiting folks from Well Fargo looked at the history of the stock market, examining trends and sharing observations of the stock market patterns over time, discussed the definitions of stocks, bonds, mutual funds, exchange traded funds, diversification, trading costs, and social investing strategy. 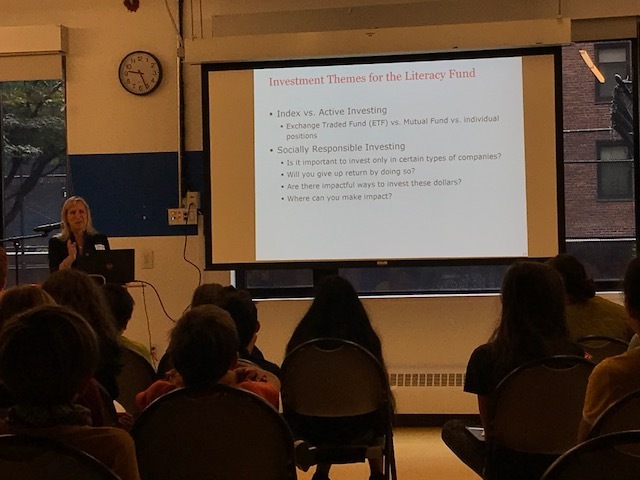 Socially responsible investing was also covered, as it is one of the main themes of Speyer’s literacy fund, exploring how they, as portfolio managers, will decide impactful and meaningful ways to invest. And then it was time for the always-exciting stock picking simulation game! 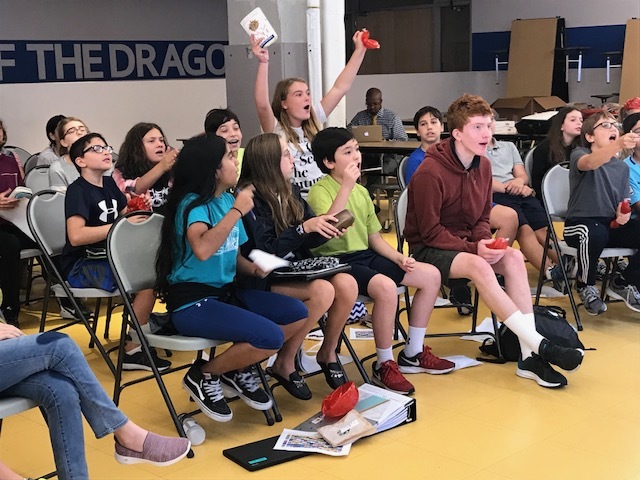 Perhaps the most energized group to compete in the game, this year’s seventh graders were split into small groups and had four rounds to choose how to allocate their investment among a group of five imaginary stocks (as well as an index fund and a value fund), hoping to have the highest percent return from their picks at the end of the game. When the results were announced after each round, the Dining Hall could have been mistaken as a boisterous trading floor, with high-fives and cheers, groans and gasps, and possibly one or two students dropping to their knees after seeing their investment strategy didn’t work as well as they had hoped. Stay tuned throughout the year for the latest happenings with Speyer’s Financial Literacy Program (read all about it here). We all wish the seventh graders well with this new responsibility – and may the market be ever in their favor!